The massive 1,500-ton double overhead bridge crane that was installed in the Assembly Hall in June now has a sibling. Just as long and as impressive, albeit much lighter, the girders for the 50-tonne auxiliary crane were lifted last week onto their rails at a height of 39 metres. This time, the weight of the auxiliary crane girders and the installation height made it possible to use a telescopic crane that operated from inside the Assembly Hall. The operation last June had required the use of one of the tallest and most powerful crawler cranes available. Operating from outside the building, it lifted the girders through an opening in the building's roof. This time, the weight of the auxiliary crane girders (42 tonnes as compared to 186) and the installation height (39 metres as compared to 42) made it possible to use a telescopic crane that operated from inside the Assembly Hall. 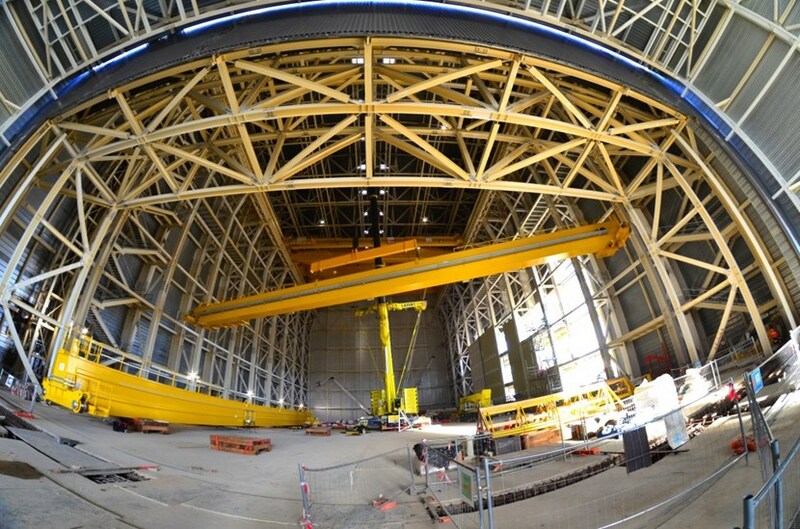 The full lifting system for the pre-assembly of Tokamak components is now in place. When the Tokamak Building is complete, the rails for both the principal and auxiliary cranes will be extended 80 metres to allow for the transport of components between the Assembly Hall and the Tokamak assembly area.